We took a much-needed family vacation last week to Granby, Colorado, where my parents own a condo at Granby Ranch. There is a golf course now that they can see from their window that I've always wanted to play, but I honestly think the last time I was there in the summer they hadn't even finished building out nine holes. So golf was definitely on the agenda this time around. My dad, husband, and I played one afternoon this week, and I really enjoyed both playing with them as well as experiencing a fun Rocky Mountain golf experience. Here's my review of Golf Granby Ranch (complete with some awesomely amateur iPhone photos). View into the 16th green from the fairway at Granby Ranch. Golf Granby Ranch is a fun mountain course that is challenging, but doesn't pull the kind of tricks on you that more robust courses do. In that way, it is an accessible course for groups of players with various abilities, although don't expect it to be a very fast round if you have some very new beginners in the group. More experienced players will also enjoy the fact that the course has enough challenge to make each good hole feel like a reward, even if it they are sandwiched between some slightly punishing holes. In short, a player doesn't need to know expert course management tricks to enjoy themselves, as long as they have good, or even basic, understanding of fundamentals. 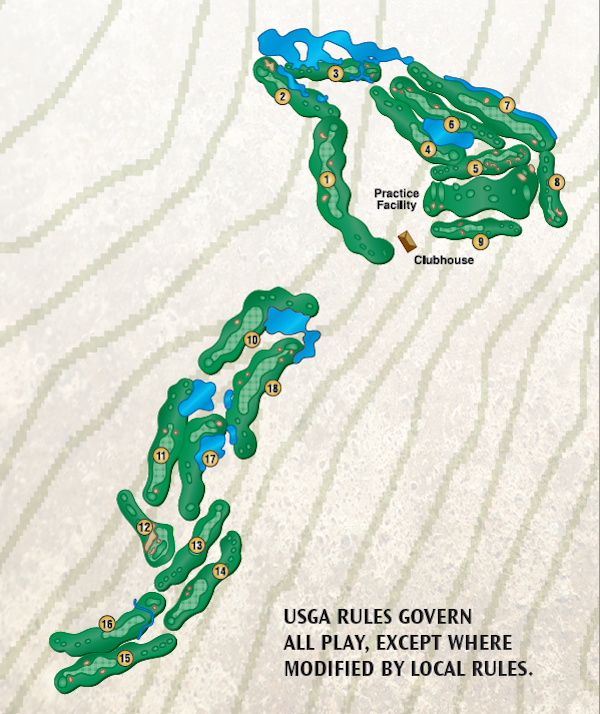 Granby Ranch golf course map. If there was a topographical rendering of the surrounding mountain, you would see how the front nine nestles into the valley along the Fraser River and the back nine was a little more carved along the mountainside. What I loved is that the front and back nine are very different, which makes it almost like playing a whole new course after the turn. The front side in the valley by the Fraser River feels friendly and familiar and doesn't pack too many punches. This makes it all the more a shame that I didn't get in my par putts while I had the chance because the ninth hole climbs up from tee to green, and kept climbing through the turn. The back nine is carved into some very beautiful but challenging mountain vistas, complete with natural areas filled with brush, wildflowers and succulent plants, and blind tee shots where you feel like you're a million miles above sea level. View of the Granby Ranch golf clubhouse from the 8th tee box. the driving range is situated between here and the clubhouse, and the ninth hole can be seen on the left side climbing back up towards the clubhouse. The elevation keeps climbing up from there! Blind tee shot at Granby Ranch on the 13th hole. The hills were alive with the sound of three-putts. My particular favorite stretch was along the 7th (a long par 5) and 8th (par 3) hole, where the gentle babbling of the river makes for a pleasant soundtrack and the valley narrows around the river with mountains on either side. I also loved the way trains would slowly pass by on the other side of those holes as they approached the town of Granby (I'll understand if you think that is a little nerdy, because it kind of is)-- and especially loved that they were quiet! On the front nine at Granby Ranch, a train winds through on the opposite side of the Fraser River. The trains don't make noise as they pass since they slow down as they approach the town. I might be a little nerdy, but I thought this was cool. The rental situation was decent for a small, seasonal course. As my dad was waiting in line to pay before the round I snooped a little to see what the selection would be. I have rented some gnarly sets in the past and wanted to see if I could tell what the "premium" rental sets (which they rent for $35) would be. Their selection didn't look that wide, and the "standard" rental sets ($18) I could only describe as Frankenstein because of how the irons, woods, and drivers were from a variety of brands pieced together from older sets. Despite that, at least they were clean and in good condition (I rented once and the clubs were not only old and beaten up, but also filthy from years of use). Fortunately, they had three brand new sets of Strata clubs, including a women's set. Not sure what the lefty situation would be. We played after 2 p.m. when the twilight rate kicked in but we knew we could get in a full round, and I thought that $60 per player was a fair value. We did not eat at the grill, but there is a nice deck overlooking the front nine that I can imagine would be great for a couple of beers and a burger after a round. Will have to check that out next time! In case you were curious after reading my Father's Day post, I did manage to take several photos with my dad this time to prove that we did indeed play a fun round together! And I also wrangled my husband into some photos as well, and he was a good sport about it too. Aren't I quite the catch. Thanks for reading my review of Golf Granby Ranch! We came home just in time for me to play with the league tomorrow, so hopefully I will have a good round to report back.